This week in Wyoming, one of my childhood dreams came true. 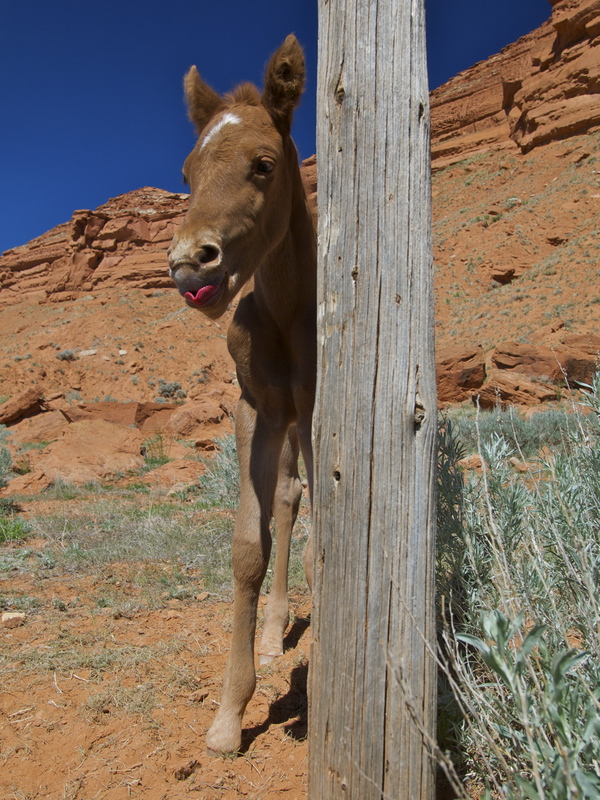 Somewhat lost on back roads, searching for Butch Cassidy’s Outlaw Cave in the middle of nowhere Wyoming, I happened to look off to the side of the red dirt road and saw something that made my heart stop: a tiny red foal, all alone, laying down among the red rocks, no mare in sight. I immediately pulled over, left the dogs in the car and climbed up the bank above the road to get a better look. I grew up with horses, but I’d never seen one so new; the foal was no more than a few hours old. As I approached, slowly, talking sweetly, and holding my hands palms up and open in front of me, the baby whinnied and wobbled to her feet. Mares will sometimes leave a foal if it is sickly or deformed, but this one seemed well enough and looked perfect. She took a few unsteady steps towards me and whinnied again, making desperate suckling motions with her mouth. Gently, I ran my fingertips down her velvet nose, the softest thing I’ve ever felt, and she latched on to my finger. She was alive but thirsty, hot and stressed. She needed her mom, fast. Miraculously, I had an idea where her mom was. A few miles back down the road, I had passed a field of mares and foals and noticed one mare running back and forth, calling frantically. At the time, I thought, poor thing must have lost her foal. I never dreamed I’d find it! Quickly I ran through my options. She was too weak and wobbly to walk back to the field, even if I could get her to follow me. I could try to put her in my car or in my Teardrop and drive her back down the road, but I was afraid to handle her too much, in case my scent or the dogs’ might make the mare reject her. So I told her I’d be right back, ran to my car, drove back to the ranch and tracked down the owner, an older man with a big hat and a bigger moustache. Sure enough, one of his mares, a first-time mom, had gone off to give birth overnight and returned in the morning without the baby. He assumed it was dead and seemed incredulous to hear that she was on her feet. He asked if I would go wait with the foal while he hitched up his trailer. The filly was still standing where I left her. I grabbed my camera and sat on the ground in front of her, talking sweetly, assuring her that help was on the way. I wanted so badly to run my hands over her, to feel that newborn baby softness again. Even her tiny hooves were still soft and curled from the womb, not yet hardened by life on earth. I looked into her big brown eyes and she looked back at me, the first human she’d ever seen and it was love. Filly Love. Those eyelashes! Those ears! That crooked star! What a doll. In my childhood fantasy, I find an orphaned foal and she’s mine and I’m hers, forever. I raise her by bottle, teach her everything I know about being a horse and she teaches me everything she knows about being a horse mother and the two of us grow up together. Now, 30 years old and tied to nothing but a couple of dogs and a Teardrop trailer, I’m glad to know her mom’s just down the road, hopefully eager for a reunion. Watching over this foal for a few minutes is as close to motherhood as I want to get. 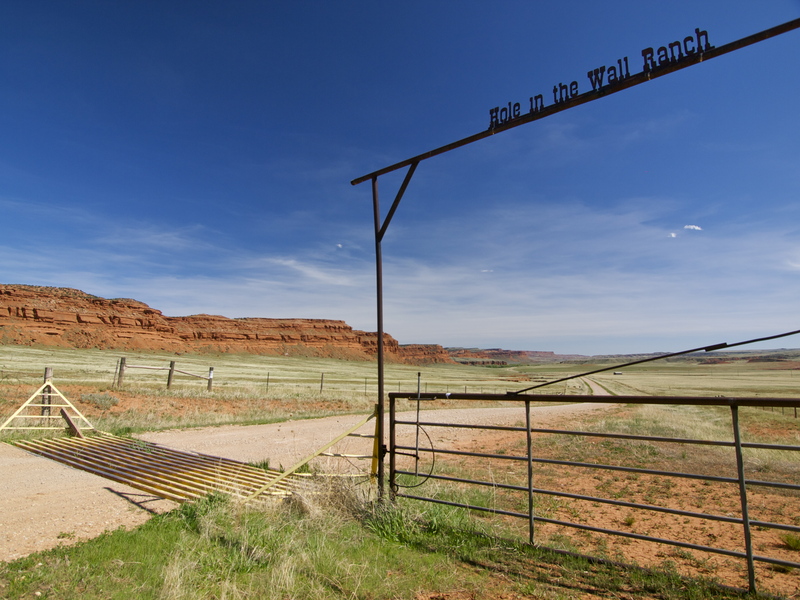 When the rancher arrived, he looked her over, and told me he thought she’d be all right. The mare was still looking for her, hadn’t yet forgotten and hopefully they’d be happily reunited. He guessed the steep bank above the road might have been their undoing; if the mare gave birth up here, the baby may have been unable to follow her home. With that he picked her up, carried her down the bank and loaded her into his trailer. Goodbye Filly, Best of Luck! As he was driving away, he leaned out the window of his truck and asked me, “Hey what’s your name?” I told him and he said, “It’s a filly. I’m going to name her after you. Thanks again.” I’ve never been so honored by anything in my life. Dedicated to all the moms in my life: my mom and her mother, Meg and Meg, Amy and Lesly, Shumin and Reinhild. You ladies are amazing. Happy Mother’s Day! This entry was posted in Cowboys & Horses, Photography, Road tripping!. Bookmark the permalink. A lovely post. As a child, I had exactly the same dream! Our mothers day was two months ago but a story like this needs no occasion. I look forward to sharing it with my own, two-legged filly. Such a wonderful reminder of how precious and fragile life is. A sweet sweet story! 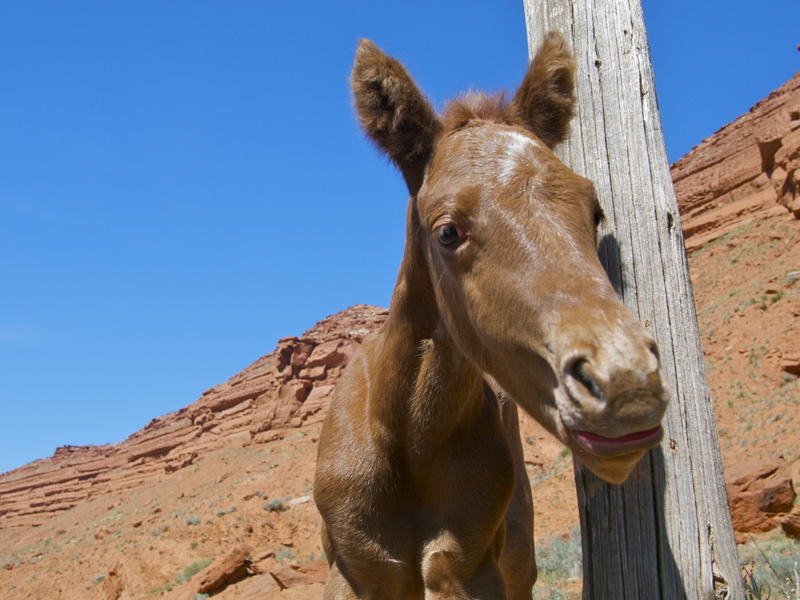 Another great post – I have seen calves born but never a horse. This was a gift for both of you. Maybe you’ll go back someday. Great Mother’s Day story! So glad you had this experience. Love your blog. That is such and amazing story. I’m enjoying following your blog but I now have a new found respect for you. The pictures are awesome too. LOVE this story and the photos! Good for u, this made me drop a tear. Poor filly, glad that u spotted the poor thing. Oh, and it’s ok to touch and handle a foal after it’s born…actually a good idea to help imprint a foal with humans so they learn to trust humans. The scent of a human on their foal won’t discourage a mare to take care of it, just as the scent of a predator, like a mountain lion, on their foal (in the case of a foal that’s been rescued or saved from attack), won’t cause them to abandon their foal. Mares are very dedicated mothers. Sounds like this foal’s mare might have been a new Mother and her herd might have gotten frightened by something and when they took off, instinct told her to take off, too, leaving behind her new baby, who couldn’t keep up. What a smart foal to stay in one place and not wander off, though. 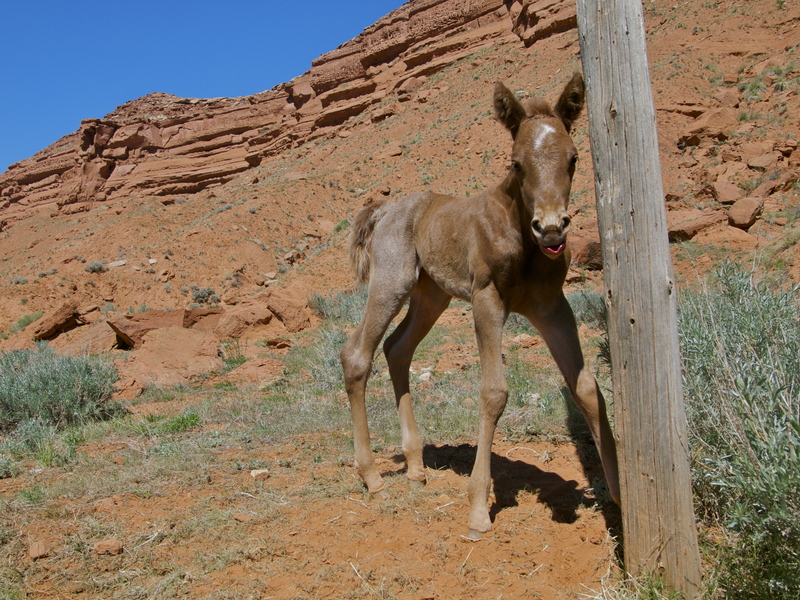 Thank you for contacting the ranch owner so the sweet little foal could be returned to her Mother. What a wonderful Mother’s day for that Mama horse. A wonderful story, and one that I will always remember. Enjoy your travels, Mary. Great story…so glad you found the colt and that she was ok and reunited with her mother! Love the Hole in the Wall area! 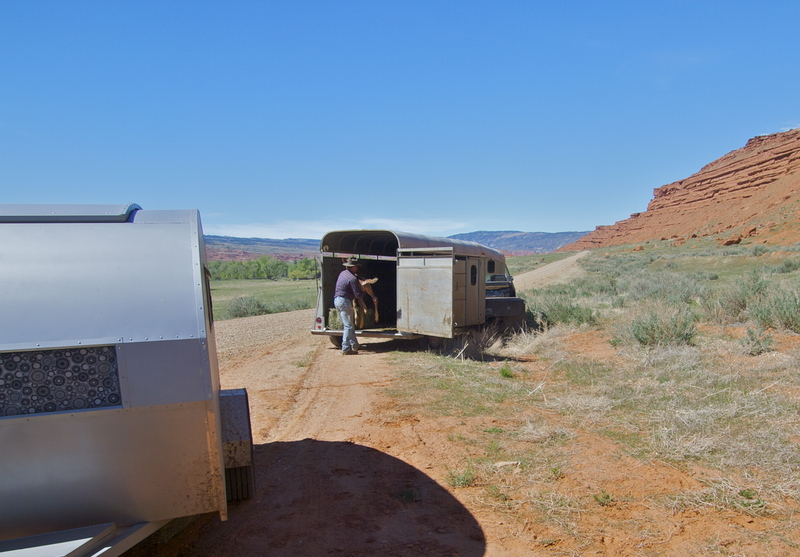 I did a wagon train there a few years back…a GREAT time was had by all! I live in Casper and am loving your stories of traveling around Wyoming! What an awesome story. I hope that the mother does not reject the little one. So precious. too bad you will never know her fate. Great story and outcome. Good blog – keep it up! Brought a tear to my eye. Glad all worked out for the best. Can’t write too much – tears are making the keyboard foggy. Truly touching. I love, love, love this…You should write a book. What an amazing story. Great post- I have always wanted to do everything right, and you did here. That was my dream, too :-). Wow!!! What a great story! Keep up the great work of animal rescue and wonderful blog posts! What work do you do as a scientist? I’m an artist by nature, and a wanna-be scientist by private study. late to this, but wanted to thank you for sharing this. so affirming! I love this sweet story and the beautiful baby colt. Your pictures are wonderful. I hope your travels with your pups & teardrop continue. Keep truckin’. A tremendous tale, Mary, and a very interesting blog. Someday, you’ll have to go back and visit that filly.